Rey Del Rio/Getty ImagesBrock Lesnar was expected to lose to Roman Reigns in anticipation of a return to UFC, but after retaining his title his trip back to the octagon may be on hold. Brock Lesnar’s rumoured return to the UFC may be on hold after he retained the WWE Universal Championship at WrestleMania on Sunday. Lesnar was expected by many fans to drop the belt to Roman Reigns, freeing him up from his responsibilities with the company, but instead, he retained his title and re-signed with WWE. While the move means that it’s unlikely we’ll see Lesnar back in the UFC in the immediate future; there’s still a way that he could make his return to the octagon. 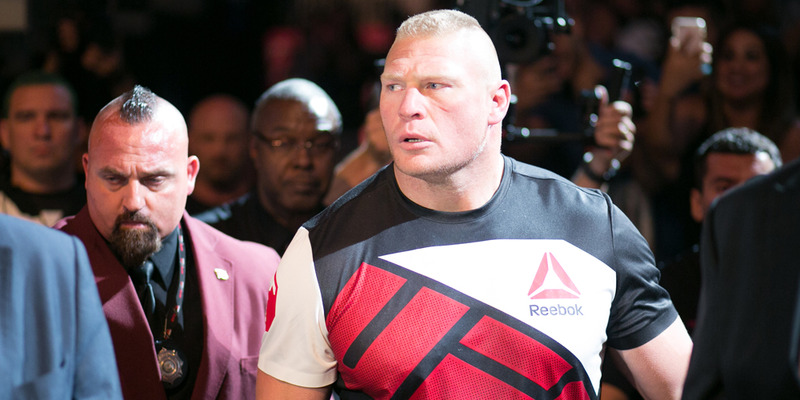 An unexpected result at WrestleMania could lead to a delay in Brock Lesnar’s return to UFC. Lesnar faced off against Roman Reigns on Sunday in a battle for the WWE Universal Championship in the headlining match of WrestleMania. Coming in as the reigning champion but with rumours swirling of his imminent return to UFC, many thought Lesnar would lose in the match, handing Reigns the belt and freeing up Lesnar for a return to the octagon. That thinking was even worked into the storyline of the match – in the weeks leading up to WrestleMania, Reigns had criticised Lesnar for his part-time commitment to WWE. But instead of Reigns standing tall at the end of the night, Lesnar left him in a bloody heap, and once again walked away as the Universal Champion. The decision to have Lesnar retain the belt left many wondering if his return to the UFC is now up in the air. UFC president Dana White had said last week that Lesnar would be back in the octagon, and with his WWE contract rumoured to have been over at WrestleMania, the timing felt right for the jump to happen. Instead, WWE announced Monday that Lesnar had signed back on, and while the details of his new deal are still unknown, he will be travelling with the company to Saudi Arabia for their upcoming “Greatest Royal Rumble” show. While there’s a chance that this turn of events means Lesnar is back with the WWE for another extended stint, it doesn’t entirely rule out his return to the UFC. The last time Lesnar fought in the octagon – a 2016 win by decision over Mark Hunt that would later be overturned due to a doping violation – Lesnar was technically still under contract with WWE, and just given a clearance to take the fight. There’s a chance that if Lesnar’s to make another appearance in the UFC, it would be under similar circumstances. Still, WWE’s announcement means that he’ll be travelling with the company for at least the near future, and it’s a safe bet that Lesnar would need a few weeks of focused training before hopping back into a UFC match. At 40 years old, things will have to move fairly quickly if his UFC comeback is to be a reality. Nothing is set in stone yet regarding Lesnar’s future with the WWE, but for fans pining for his return sooner rather than later, Sunday’s result at WrestleMania was not the ideal outcome.